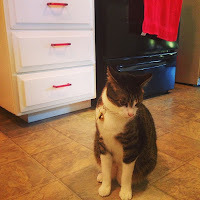 I've been redoing my kitchen for a few weeks. It's been fun and I haven't done anything overly expensive. I think painting was the most expensive part, just because I never seem to have enough painter's tape. It's not completely done just because I ran out of the special screws I need for my Ikea hardware (the screws they came with are much too short to fit through my thick drawers and cabinets) and four drawers still have the old hardware. I plan to go buy more screws but I haven't gotten around to it yet. 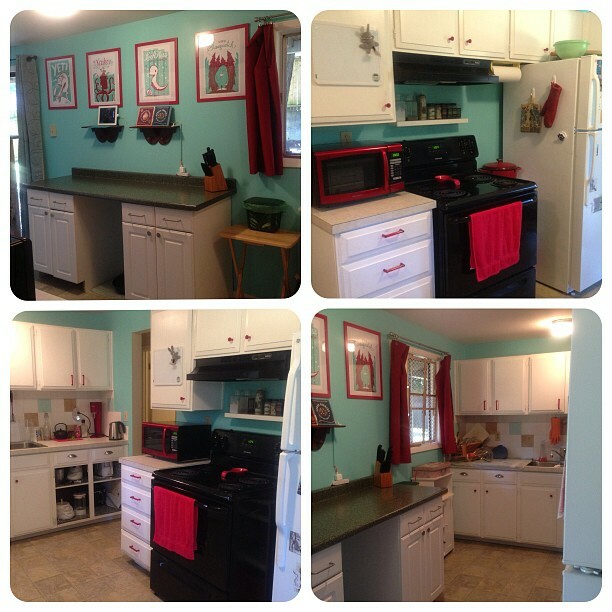 I went with a turquoise to match the artwork I bought from FamilyTreeDesign.net and to go with all the red appliances we already had. 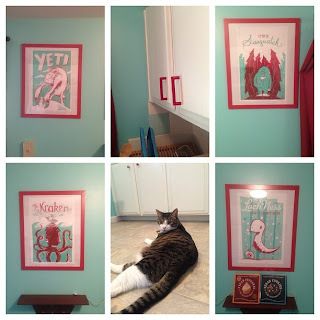 I'd been eyeing those monster prints forever and I finally had a little extra money so I went for it. I love the way it all ended up matching up. Ignore the baby gate in the window; we have to keep the cats from popping the screen out and escaping. 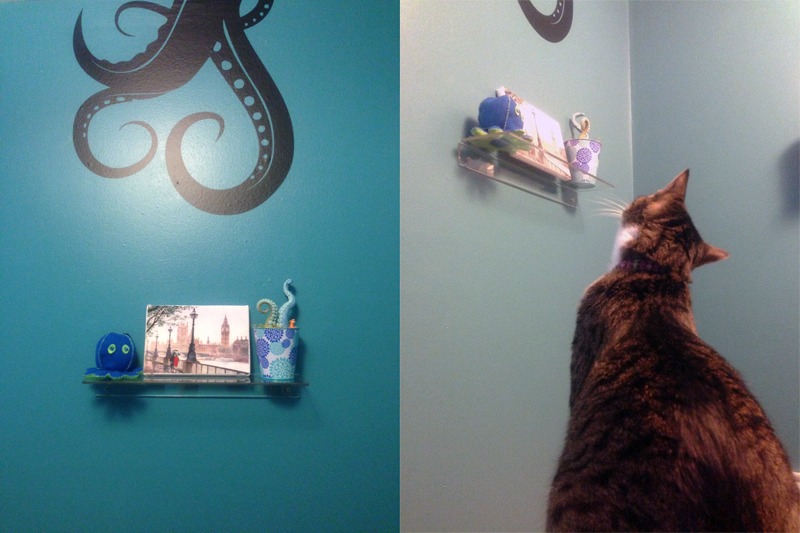 Here we see some pictures of the artwork, the new Ikea knobs, and the cat who never helps. I stole a trick from Pinterest (who hasn't these days?) 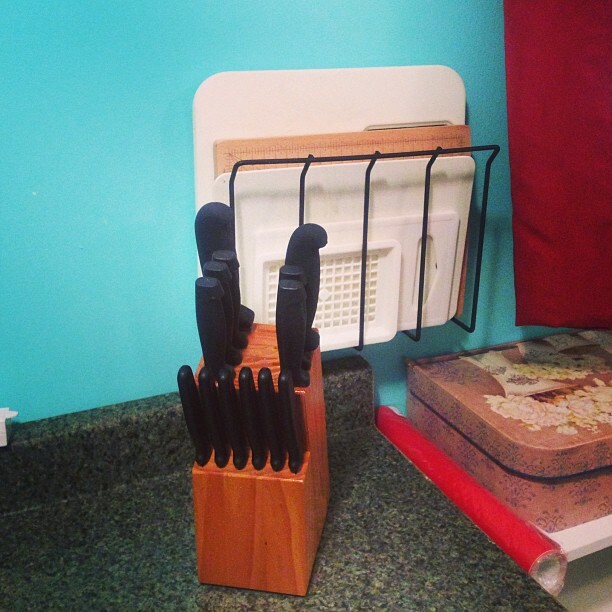 and bought a $12 magazine rack from Amazon to store my cutting boards right behind the knives. The second picture is an in progress shot from when I got rid of the brown tiles behind the sink. 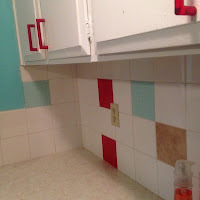 I didn't have the money to actually replace the tiles and sanding/repainting seemed like way too much work. Sooo, I went to Amazon looking for a solution. I somehow stumbled on vinyl craft... sheets of some sort. My last craft item is something I saw on Etsy and knew I could make on my own, since I love working with clay. I've had the same pack of Sculpey for over a decade. I honestly have no idea how it hasn't dried up or grown mold, since it's not sealed or anything. It just sits in a cardboard box on a shelf. I pulled out some of the colored clay and got to work. Initially I was going to try to recreate the tentacle plant I saw on Etsy pretty faithfully, but then I remembered I'm lazy. Instead of going to look for the right colors of clay, some actual terracotta pots, and moss I just went to Target. I found the little bucket in the dollar section, and the moss was a vase filler on clearance for $1.50. It came with some ugly paper eggs and a bunch of twigs, but I just threw those away. I cut up a plastic cup and stuck it upside down in the bucket. 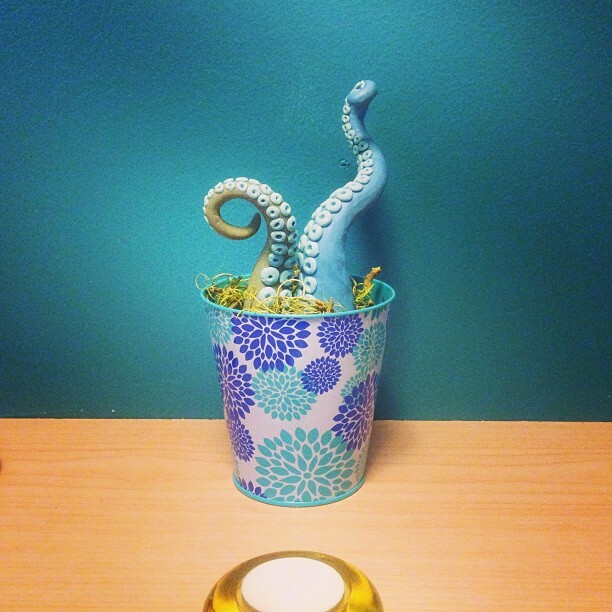 The tentacles got hot glued to the cup to keep them from falling over and I just jammed the moss in around them. Overall the tentacles took me about thirty minutes each because of all the little suckers I put on. It was absolutely worth the time. It's so damn cute! 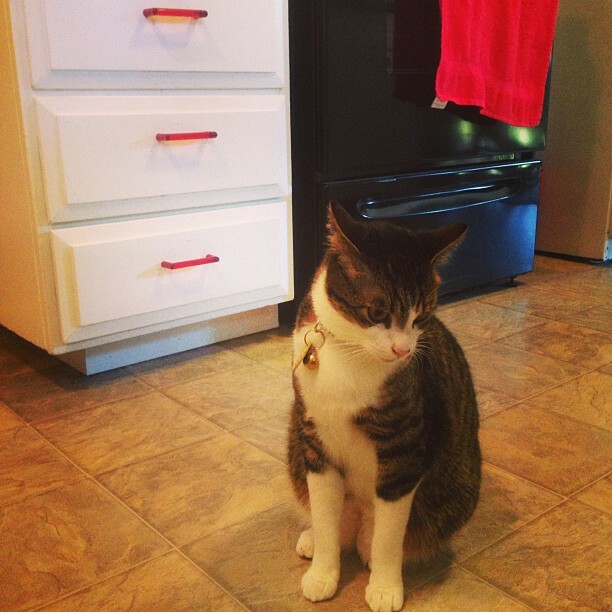 Of course as soon as I set it down, The Cat Who Never Helps showed up and and tried to eat the fake moss. I had to put the thing up on a shelf to keep him from giving himself brain damage, and he spent some time admiring it from afar.